Help us to make Kune better. Kune is a somehow young initiative still in a beta state of development, with a small community of developers behind it. In the current stage, the most urgent need is to have more hands to improve the project, fix annoying bugs and add features that are missing. Thus, we call for your help. We would like to ask the community of existing developers or users with some Java or HTML/CSS knowledge, the developers who would like to find a challenging project in the Free Software & Free Culture world, to join us. Join to make Kune a reality and give it a new push so Free Software ideas can spread outside of the software world. All Kune code is licensed under the GNU AGPLv3 license, encouraging the use of free/libre web services. All the technologies, libraries and tools used are 100% free/libre. Wave protocol for collaborative/simultaneous editing and decentralized federation. Emite: This library implements the XMPP communications protocol using the bosh technique with GWT. It also handles the XMPP Instant Messaging protocol with a modular architecture to support easy implementation of XEPs to build any other XMPP based services. It also includes the full-featured chat GUI that Kune integrates. The Kune project is hosted in the forge of OurProject.org. At first glance, one might be afraid of the size of the project (check Ohloh for a few stats). However, we have put a huge amount of effort into implementing it in a modular and structured way, using plenty of design patterns. Thanks to gin and guice, developing, keeping modularity and extending our web client by adding new functionalities is rather easy. Kune tries to keep a high level of Quality Assurance, making sure that major bugs are not overlooked by developers. There is an intensive use of JUnit and Selenium, which turned out very helpful in this task. However, until we reach a broader community, this is a difficult task for just a few eyes. We really need a user base for the testing of the current features of Kune and its libraries, that would report the errors and bugs discovered. For reporting bugs or for enhancements requests, please use the bugtracking of Kune, or the issue register of emite. Although the objectives of modularity and structuring have been successfully reached, Kune lacks a high quality documentation: manuals, online help, tutorials, programming references, interface guidelines, and so on. Contributors of this part are encouraged to join the others in the development team. 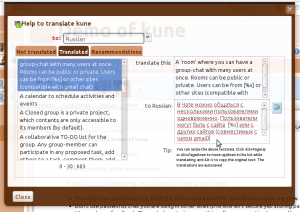 Kune has an emphasis in the support for internationalization (i18n) and localization (l10n) within the Kune application. It provides an easy and transparent way to do translations of the project’s modules without messing with the code. 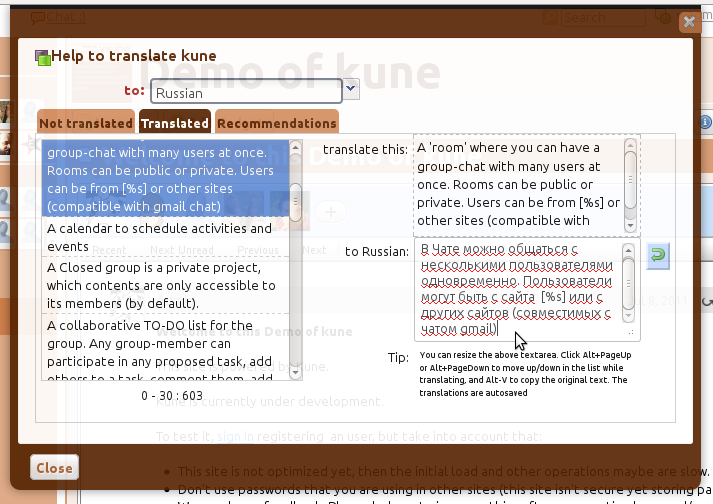 Maybe you can help in the translation of Kune to other languages (or even improve our English). If there is one thing that Kune is not very strong in, that is Art and Design. Although it does have a nice look, the project aims to provide different themes to complete the easy customizing environment. However, for the moment this has been considered a secondary concern. Any graphic designer that could help in this matter would be highly appreciated. We strongly believe in the urgent need of Kune. We think that it could really change things “in the real world” (and not only virtually). We decided long ago not to begin spreading the word about it untill we had a prototype to show, refusing the ideas of talking about vaporware. However, nowadays we do have a prototype to show ( as you can see here) so the time has come to talk about the project, and talk loudly. If you like the project, we ask you to spread the word about it. You can give us some feedback about it (advice, suggestions, criticisms…). But you can also talk about it with other people that could be interested, write a post in your blog, tweet about it, mention it in a forum/mailing list/delicious/social network… Maybe if you do not have time to contribute, others will… and this is crucial for us. Kune is getting prepared to jump into the cyberspace and it should do that with the help of the community. Even with no time or skills, you can still help us by providing some economic support. As a community-supported initiative, Kune cannot provide salaries to their contributors, and it has no enterprise support. Moreover, ourproject.org and Kune refused to receive money from advertising, as we believe free/libre initiatives must be free of ads as well (as Wikipedia does). This development is resulting highly costly in time and effort, so if you can, please donate to the Comunes nonprofit behind Kune. Me gustaría reportaros un bug sin mucha importancia que he encontrado en la demo de kune: cuando intentas crear un nuevo grupo sin haber iniciado sesión (sin ser usuario registrado) entra en un bucle del cual no puedes salir si no modificas la url (o inicias sesión), es decir, no funciona la opción “cancelar” del formulario de acceso al usuario registrado y tampoco funciona la opción atrás del navegador, en los dos casos recarga la pagina solicitando el nombre de usuario y la contraseña. El navegador usado al detectar el bug fue Chrome.